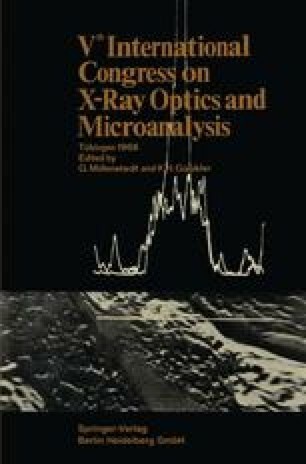 The magnitude of the deadtime correction must be known in quantitative electron microprobe analyses since failure to apply the correction can lead to errors in the measured relative X-ray intensity ratio, k, which often are of the same magnitude as the precision in the determination of k; even greater errors will result when analyzing dilute alloys while using pure element standards. Heinrich, Vieth and Yakowitz  developed a simple method of determining the deadtime, τ, in the electron microprobe based on the model proposed by Ruark and Brammer  where the true counting rate, N t 0 , is given by N 0/(1-τN 0) and N 0 is the measured X-ray intensity from a pure element. Several investigators [3–7] have reported that τ is a function of the counting rate and becomes essentially zero below intensities varying from 4,000 to 14,000 cps [3–6]; in the Ruark  model, τ is independent of intensity. In an attempt to resolve this problem, a careful comparison was made between the current method described by Heinrich et al. , and the ratio method, which gives a range of zero deadtime, or negligible coincidence loss, described by Short , and Borile, Short and Tabock . The deadtimes of the electronic components were measured, both individually and as complete counting systems, in an attempt to identify the deadtime source and to correlate X-ray (current and ratio methods) and electronic deadtimes.